Early summer gives us the chance to observe the Milky Way's globular clusters: vast spherical groupings of stars which orbit the center of our galaxy like moths around a flame. Globular clusters are distinguished from galactic clusters because of their age (very old), size (often a hundred thousand stars or more) and location (above and below the main plane of the Milky Way). They are interesting targets for any sort of optical aid, binoculars or telescopes. In binoculars, most globular clusters do not resolve into their component stars, but appear as an ill-defined hazy spot. As more telescopic power is concentrated on them, globular clusters gradually resolve into stars. In small telescopes the outer reaches of the cluster start to reveal stars; in larger telescopes more and more stars are revealed. In a really large Dobsonian telescope, the true nature of globular clusters is resolved: countless tiny stars all the way from the stragglers at the outside edges to the concentrated brilliance at the cluster's core. While galaxies often disappoint beginners because of their lack of detail in a telescope, a globular cluster seen in an amateur telescope of moderate aperture (8 to 12 inches) is actually more beautiful visually than in any photograph, because the human eye can encompass the whole range of stellar densities. The largest and richest globular cluster in the Northern Hemisphere is perfectly placed for observation on these warm evenings of early summer: directly overhead. Go out to a dark location around 11 p.m. this week and lie down on your back (a blanket or lawn chair will be more comfortable). If your feet are pointing south, you should see pretty much what's in this chart. The three bright stars (Vega, Deneb, and Altair) of the summer triangle will be to your left, and Arcturus will be to your right. Right in between are four stars of medium brightness which form a keystone shape: these are the body of Hercules. With binoculars take a look just below the star in the upper right of the keystone, a third of the way to the star at the lower right of the keystone. You should see a faint fuzzy spot: this is the Great Cluster in Hercules. Once you've located the Great Cluster, wait an hour until it moves away from the zenith. Now you should be able to point your telescope at it (hard to do when it's directly overhead.) If your telescope is 4 inches (100 mm) aperture or smaller you will see a glowing patch of light. If your telescope is larger, you will begin to resolve the cluster into stars. In a telescope of 8 inches (200 mm) or larger it is an object of great beauty, like a gigantic swarm of fireflies. If you're at a really dark site and can see the Milky Way – many urban and suburban residents have never seen this milky swath of light that is quite noticeable under dark, rural skies – notice how far the Hercules Cluster is from the main band of the Milky Way. This main band represents the center of the galaxy and the primary spiral arms, which combined hold the vast majority of our galaxy's stars. Although globular clusters are part of the Milky Way, they orbit independently around the core of the Milky Way, but not in the plane where the majority of the galaxy's stars lie. There are more than a hundred globular clusters associated with the Milky Way, but they all lie well above or below the plane of the galaxy itself. 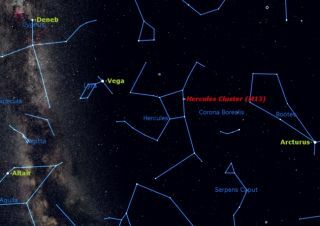 The Hercules Cluster was the 13th object catalogued by Charles Messier in his catalog of objects which he thought could be mistaken for comets. Therefore it is often called Messier 13 or M13 for short.